Do you love to travel? Would you be excited to systematically document your cumulative travel experiences across the United States? 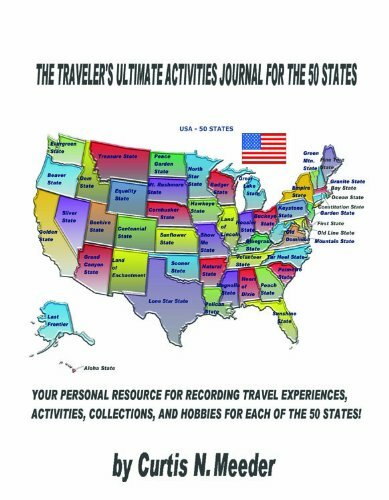 The Traveler s Ultimate Activities Journal for the 50 States offers a flexible framework to capture your uniquely personal travel adventures. Whether your travels relate to work or leisure, the journal format encourages the efficient organization of travel records and accomplishments in multiple modes. These include separate sections in the journal for category/activity lists; template maps of the United States and each of the 50 states; a novel scoring table to measure the quality of your travels, state by state; and travel planning pages for each of the 50 states related to your personal travel objectives. The journal is not a travel guide with suggestions of what to see and do. Instead, the premise is that you, the journalist, based on interests that you are most passionate about, get to decide the activities under the categories of sightseeing destinations, pursuits, hobbies and collections, related to travels across the 50 states, that you wish to track. Each journal becomes a uniquely personal record, reflecting the travel ambitions and experiences of the journalist. Curtis Meeder has been an avid traveler and record-keeper since his teenage years growing up in Michigan. Through the course of his career as a water resources planner, he has had opportunities to travel and work at a number of locations around the country. This has fueled his tracking of both work and leisure travels, and an expanding list of travel-related activities. It has also prompted the development of a unique scorekeeping system, with associated activity lists and outline maps, which comprise the format for The Traveler's Ultimate Activities Journal for the 50 States. Mr. Meeder is a graduate of Michigan State University and the Johns Hopkins University School of Advanced International Studies. He currently resides in Wexford, Pennsylvania, just north of Pittsburgh. He and his wife Cindy are the parents of two adult sons, and have enjoyed family vacations in the Northwest, Midwest, Pacific Northwest, and Texas over the years.